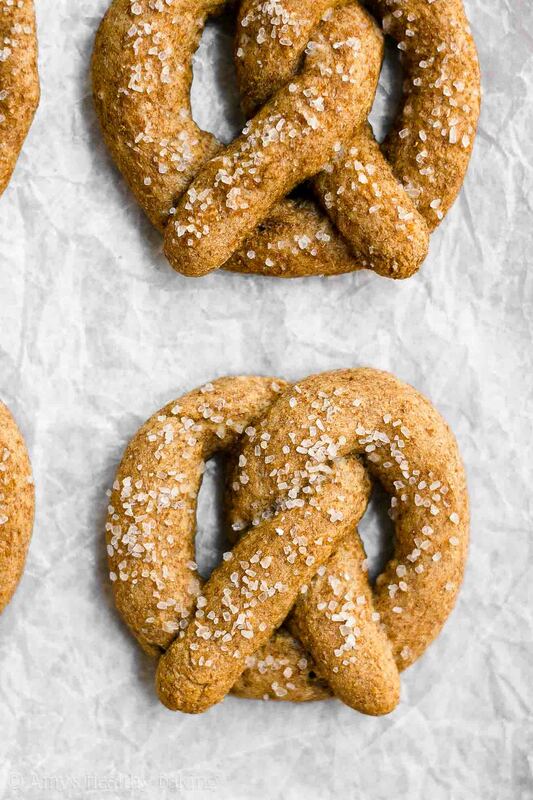 Learn how to make healthy soft pretzels entirely from scratch! Only 50 calories! Complete with thorough step-by-step instructions so your pretzels turn out perfectly! I teamed up with Red Star Yeast® to bring you today’s recipe! They’re my favorite yeast company and the only yeast products I use in my baking. Their yeast yields perfect soft and tender baked goods every time I use it! A few times each year during high school, a couple of friends and I met up at the mall. None of us liked shopping too much, so we limited our trips… But it was still fun to purchase new clothes every so often! After passing through the first set of stores and trying on dozens of outfits, we usually stopped to sit in the comfy chairs in the center of the mall for a break. Without much mall stamina, our feet begged for a break from standing so long! 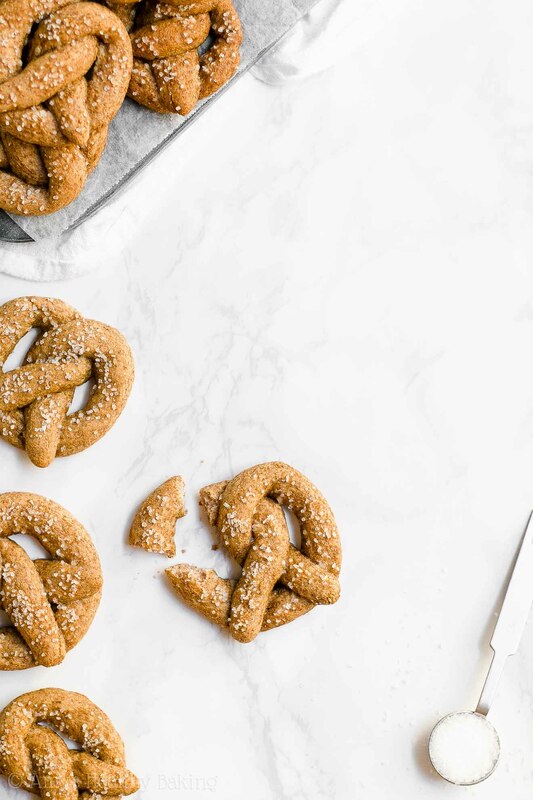 Yet I held off and made these Healthy Mini Soft Pretzels once I arrived back at my own house! 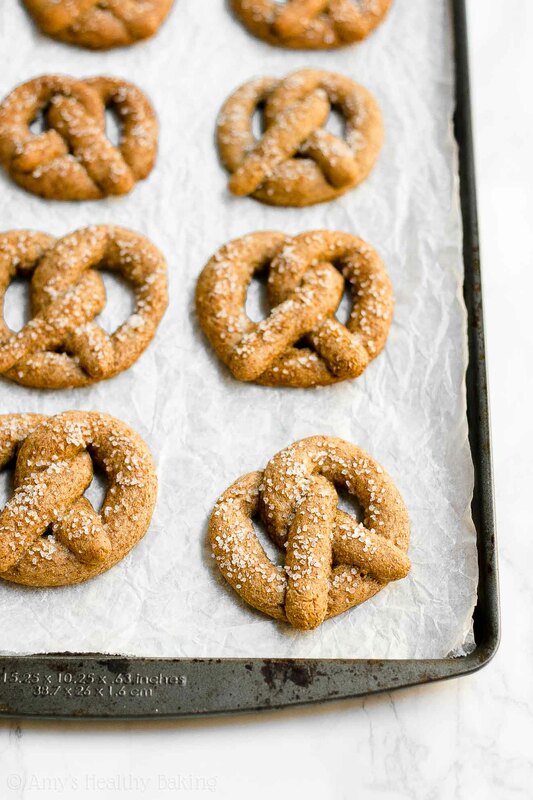 Unlike the ones from the pretzel stand, these contain no refined flour or sugar… But they’re just as soft and delicious and irresistible, and they’re only 50 calories! So I definitely don’t need to walk around the mall for an entire afternoon to burn them off! ? 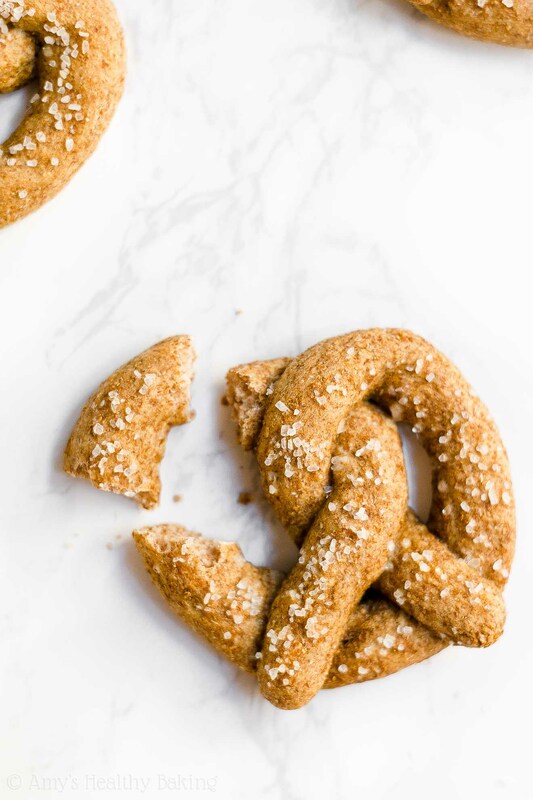 Let’s talk about how to make these healthy mini soft pretzels! You’ll start by mixing together the dough. It’s a yeast-based dough, but it’s super easy—I promise! You just need warm water (not hot! ), a bit of pure maple syrup (this kind! ), a touch of salt, and yeast. Now here’s my secret trick to all of my yeast-based treats… I always use Red Star Yeast! I tried their yeast in my dad’s bread rolls recipe shortly after I graduated from college, and it was the best batch I had ever made! They rose higher, they had a softer texture, and I’ve never used any other brand since then. I swear by Red Star Yeast! For this particular healthy mini soft pretzels recipe, I used their Quick Rise Yeast. However, their Active Dry Yeast works equally well. You can find their products near you with their handy store locator here! Once you’ve mixed in the whole wheat flour (I vastly prefer this one! ), then it’s time to knead the dough. I usually knead by hand! There’s something so soothing and almost therapeutic about flouring my hands, holding the dough, and gently folding and pressing, folding and pressing, folding and pressing. Regardless, the next step in making these healthy homemade mini soft pretzels is shaping the dough! You’ll divide the dough into 18 segments. I find the easiest way to do this is with a sharp knife! ♡ Make a U shape with the dough rope. ♡ Grab the top ends of the U. ♡ Fold the twisted ends down so they’re touching the bottom of the U. ♡ Gently press them into place. Tada! 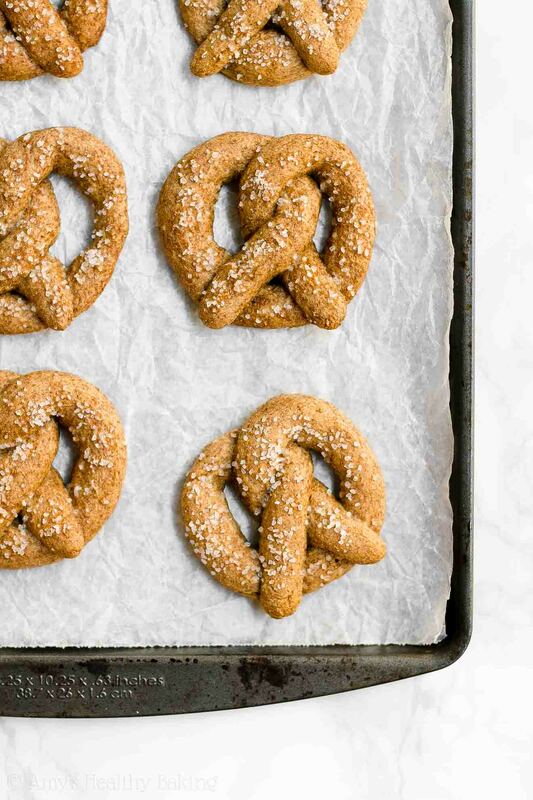 You’ve shaped your first healthy homemade mini pretzel! You’ll let your healthy mini pretzel dough shapes rise for 20-30 minutes! This ensures their insides turn out with the best light and soft texture. I know it takes a little extra time, but I promise it’s worth the wait! 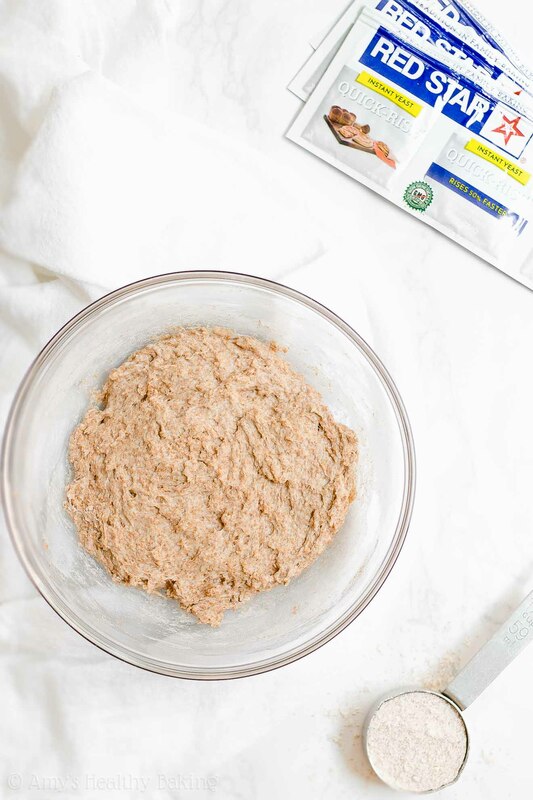 This is the most important step in making your healthy mini soft pretzels… The baking soda bath! You’ll briefly dip the pretzels in boiling water that has lots of baking soda dissolved in it. This baking soda solution is what creates that rich brown color and crispness of the pretzels’ crust! As soon as you pull your healthy mini pretzel out of the baking soda bath, sprinkle it with coarse sea salt (like this!). I’m a salt-aholic and love adding as much as I can… But you can add as little (or as much!) as you’d like! Then pop your tray of healthy mini pretzels in the oven. They don’t bake for very long, so keep an eye on them to make sure they turn out lovely and soft—not crunchy or burnt! How’s that look for an even better—and healthier—version of my favorite mall snack?? And when you make your own, remember to snap a picture and share it on Instagram using #amyshealthybaking and tagging @amyshealthybaking IN the photo itself! (That guarantees I’ll see your picture! ?) I’d love to see your healthy mini soft pretzels! I’m also hosting a giveaway with Red Star Yeast! To enter, just follow the instructions beneath the recipe! This recipe yields a much healthier version of my favorite baseball and shopping mall snacks… But they’re still just as delicious! Soft on the inside, that lovely brown crust on the outside, and a bright pop from the coarse sea salt. Truly irresistible! The pretzels are best if eaten the same day because the salt begins to dissolve once they’re stored. However, leftover pretzels will keep for at least three days if stored in an airtight container at room temperature, or at least one week if stored in an airtight container in the refrigerator. In a large bowl, stir together the water, maple syrup, olive oil or butter, and salt. Sprinkle the yeast on top, and wait 10-15 minutes or until the mixture turns frothy. Mix in 1 ½ cups of flour. If the dough is still wet, continue stirring in flour 2 tablespoons at a time until the dough begins to pull away from the sides of the bowl. Turn the dough out onto a well-floured surface, and knead for 3-5 minutes or until the dough springs back most of the way when you gently press your index finger into it. Let the dough rest for 5 minutes. Cut 3 rectangles of foil about 4” to 5” wide, and generously rub with olive oil. Place the foil onto a large baking sheet. Cut the dough half with a sharp knife. Working with 1 half at a time, cut into 3 small pieces. Cut each small piece into 3 pieces again, for a total of 18 pieces. Cover the pieces with a clean dry towel. Working with 1 piece at a time, roll it into a skinny rope at least 12” long. Twist the rope into a pretzel shape. (See details on how in the blog post above!) Put it on the prepared foil, and continue with the remaining dough. 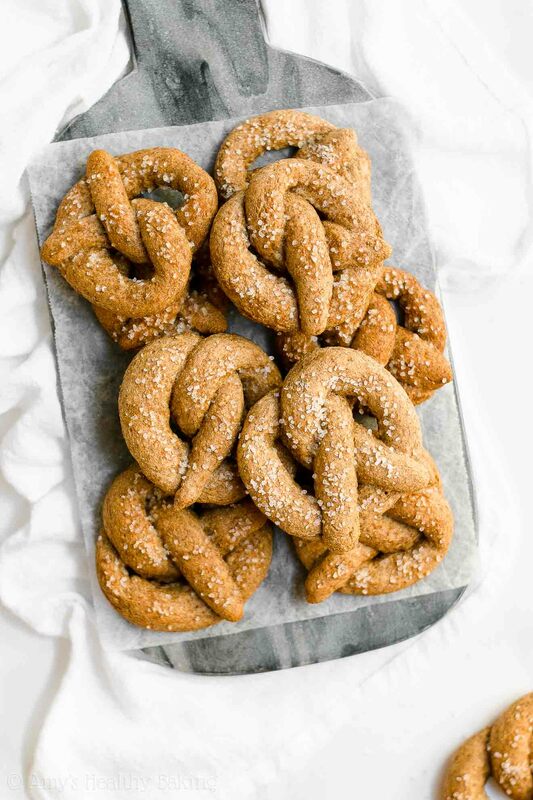 Lay the clean dry towel over the top of the shaped pretzels, and place the baking sheet in a warm draft-free spot to rise for 20 minutes or until about double in size. To prepare the baking soda bath, add the water and baking soda to a small pot. Bring the water to a boil. Place a wire rack on top of a rimmed baking sheet. Preheat the oven to 425°F. Working with one foil sheet at a time, carefully and very gently peel the risen pretzels off, and place them top-side down in the boiling water. Boil for 10-15 seconds. Carefully flip using a slotted spatula. Boil for 10-15 seconds on the second side. Carefully transfer to the wire rack using the slotted spatula. Sprinkle with the coarse sea salt. Repeat with the remaining foil sheets and risen pretzels. Line a large baking sheet with a silicone baking mat or parchment paper. Carefully transfer the boiled pretzels from the wire rack to the prepared baking sheet. Bake at 425°F for 7-10 minutes. Cool on the baking sheet for 5 minutes before transferring to a dry wire rack to cool completely. Notes: To make it easier, measure the olive oil first, before measuring the maple syrup! If you use the same measuring spoon, the maple syrup will slide right out. For the whole wheat flour, I highly recommend this kind. In my kitchen, is has performed the best out of any brand I’ve tried, and it ensures your mini pretzels fully double in size while rising in Step 6. (Other brands of whole wheat flour, as well as white whole wheat flour and whole wheat pastry flour, haven’t risen nearly as high for me!) All-purpose flour may be substituted in place of the whole wheat flour. For the yeast, both Red Star Yeast’s® Quick Rise Yeast and Active Dry Yeast will work. Use their store locator here to find their yeast near you! Any oil may be substituted for the olive oil. However, if using coconut oil, your yeast will not turn frothy in Step 2. The generous amount of oil on the foil sheets prevents the pretzels from sticking when it’s time for the next step! If you forgot to oil the foil, then you’d have to tug to get the pretzels off… And that tugging would cause them to deflate and turn out flat. Once the pretzels have been boiled, they won’t rise or change their shape at all… So be very careful and gentle when peeling them off of the foil and putting them into the water! To get that classic deep brown pretzel crust, you briefly boil the pretzels in the baking soda bath before baking. 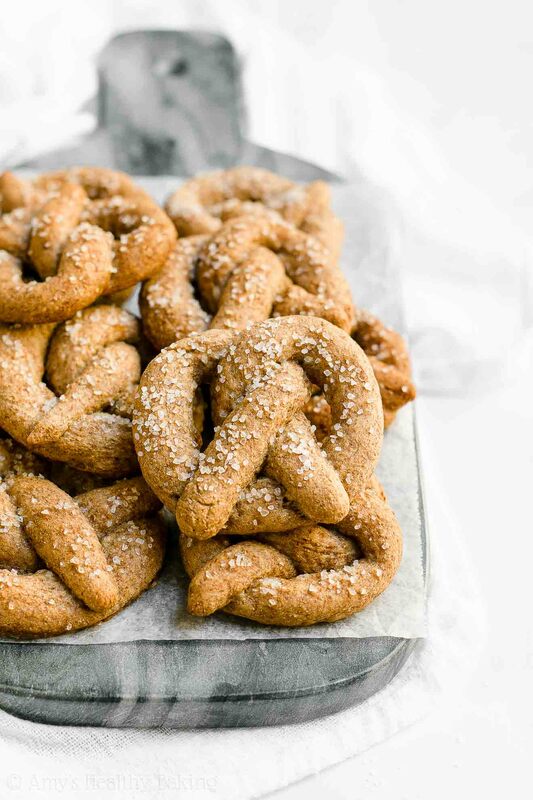 If you skipped the boiling step, your pretzels would turn out more like regular bread rolls—just in a pretzel shape! I haven’t had good luck substituting gluten-free flours in this recipe. The pretzels don’t rise or have the right soft and tender texture the way they do with wheat-based flour due to the lack of gluten. This blog post was sponsored by Red Star Yeast®. As always, all thoughts, opinions, text, photographs, and recipe are my own. I’m teaming up with Red Star Yeast to host a giveaway for you! We’re giving away an extra special package to one lucky winner. Here’s everything that’s included: 3 strips of Red Star Yeast, insulated tote bag, dough whisk, bench scraper, ‘Knead to be Loaved’ apron, bread knife, flexible cutting board, oven mitt, kitchen towel, large mixing/rising bowl, and a recipe book! *Red Star Yeast Giveaway will be open until 11:59 PM Pacific Standard Time on August 12, 2018. Open to the US and Canada only. Must be 18 years or older and have a valid email address to enter. Winner will be emailed and will have 48 hours to respond, or else a new winner will be selected. How about spelt flour? Do you think it would work instead of whole wheat flour? Auntie Anne’s Pretzels, right? 😉 Yours are way better. 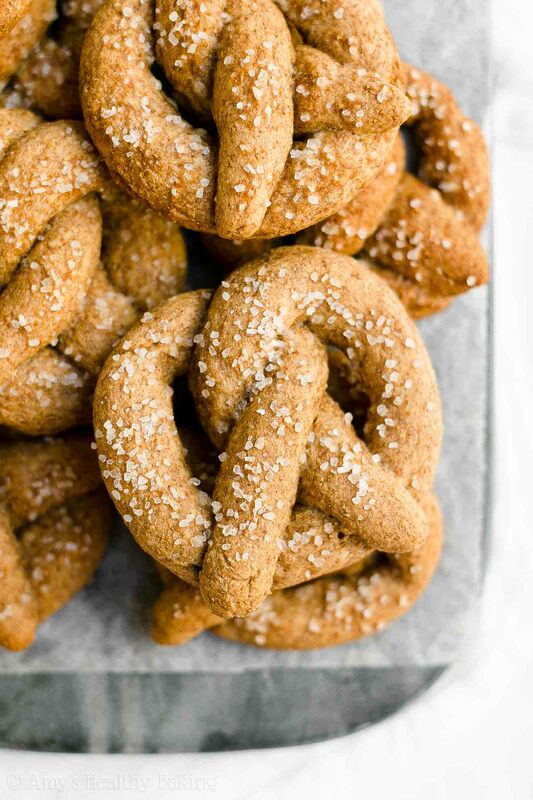 If I hadn’t seen the pretzel recipe, I probably would have said dinner rolls, but now I want to try to make these pretzels. Fun and simple recipe for an otherwise seemingly difficult bake. Tasty despite the healthy ingredient swaps! This dietitian approves!!! Thanks for sharing the recipe. It’s my pleasure, Louisa! I’m so glad you approve! 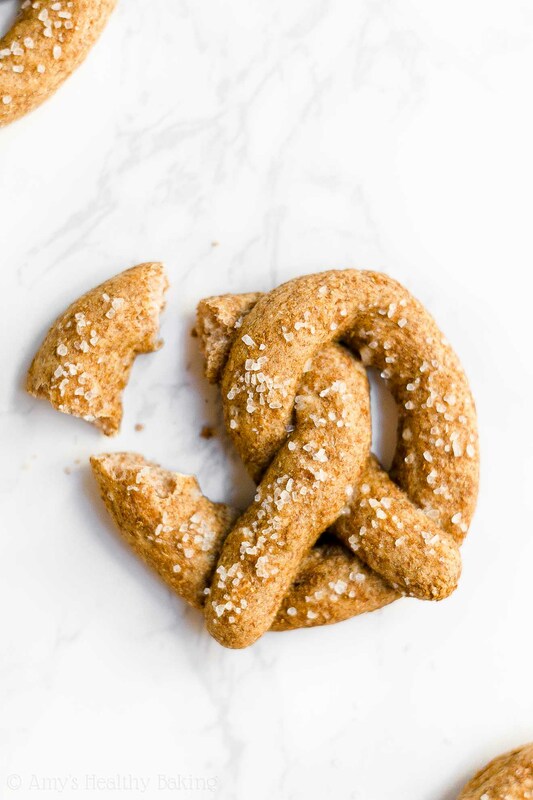 🙂 I’d love to hear what you think if you try these pretzels! I would like to make bread with the ye. One of my favorite things to bake with yeast! 🙂 I’d love to hear what you think of these pretzels if you decide to try them, Molly! I was will let you know Amy!